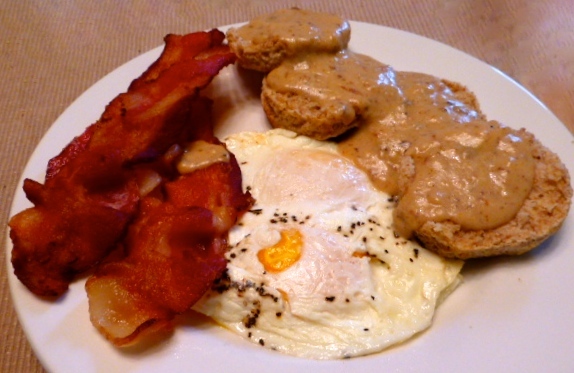 If I love anything as much or more than chile cheese grits, it is bacon and eggs and biscuits and gravy. I don’t make either treat as often as I’d like, but when I do it’s soooo good!!! I’ve taken to putting my bacon in a cold pan and adding about 1/2 to 3/4 inch of water to the pan. I then boil off the water. Fat is rendered out of the bacon and, when the water is gone, there are still enough drippings in the pan to crisp up the bacon and make some cream gravy. When you free the fond from the bottom of the pan, you get a lovely dark gravy. I do use 2% milk in the gravy so it is not pure evil on the plate. I made biscuits from scratch for this breakfast. I used a mix of all purpose flour and whole wheat flour for a little extra fiber. I used buttermilk to make them light. Who knew they’d match the gravy! I cooked the eggs in a separate pan and saved about two teaspoons of bacon drippings for the eggs. I finished it off with mesquite jelly and a dab of butter on a biscuit for dessert. And then – let’s let this be our little secret – I sopped up the remaining egg yolk and gravy with another half biscuit. Bliss on a Sunday morning. They guys in the meat department at my local supermarket make a great green chile krab salad. Krab with a K is whitefish spray painted with crab flavor and red food coloring. If you live in West Texas, that’s what you probably think crab is. 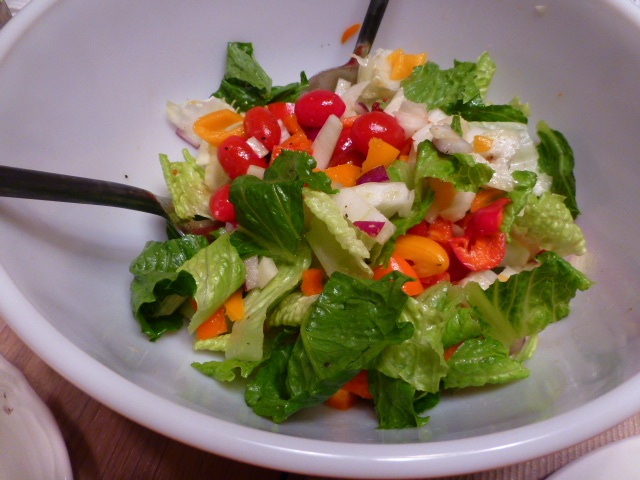 Regardless, it is a tasty substitute – especially when they add green chile to the creamy dressing. I like to stuff an avocado half with the the green chile version and place it on lightly dressed mixed greens. 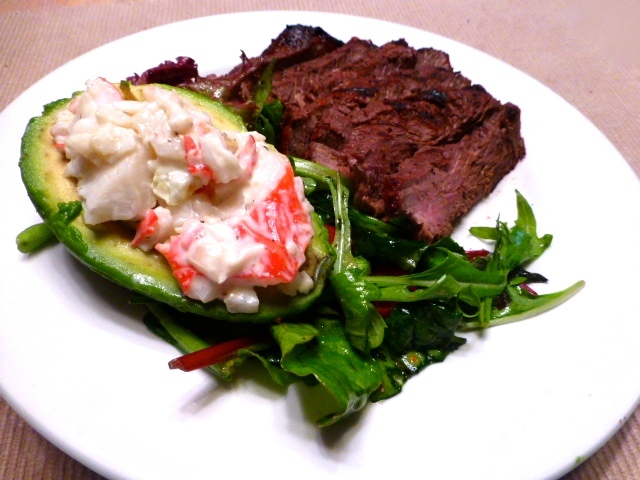 The salad complements sliced grilled top sirloin and dinner could hardly be easier or more tasty! 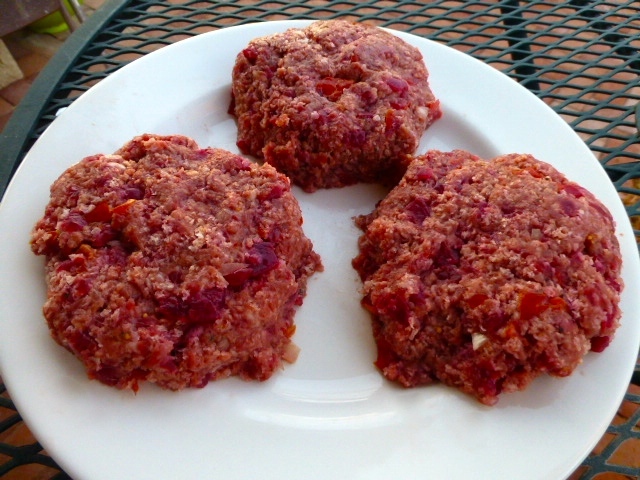 March 10, I pictured and wrote about a recipe from an Australian friend for hamburgers made with beetroot. I was amazed at how good they were. I really didn’t know what to expect from the beef and beet combination. I used canned beets, because that’s what they use. Of course, I couldn’t just let it be. I roasted a couple of big beets and used them in the recipe. I prefer the taste of roasted over canned. I added a small shear of prepared horseradish which wasn’t a bad touch. Of course, horseradish has to be used with a very light touch. My friend Darryl published a recipe for homemade horseradish mayonnaise that I want to try if I can find fresh raw horseradish in El Paso. I’ll share that experience with you when it happens. Patties on the grill. You can see the diced beet, tomatoes and onion in the hamburger, panko crumb and egg mixture. The final product! Creamy horseradish topped sliced beetroot over burger and lettuce on a brioche. On the side, mustard potato salad, carrot, raisin and pineapple salad and a few low sodium chips ’cause it just ain’t a burger supper without chips! 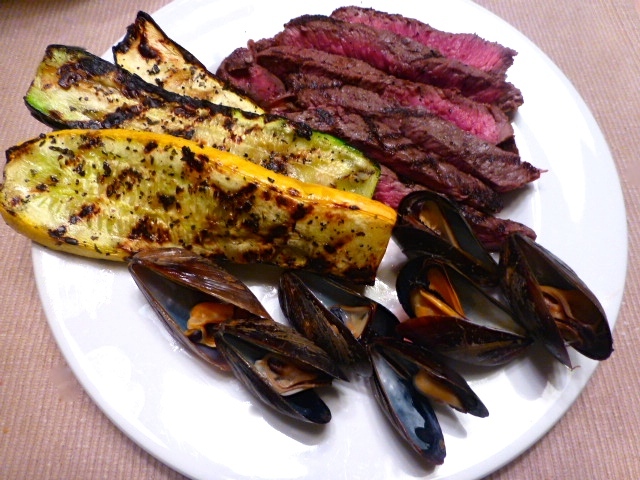 It started with a small fillet that came in a gift box from Omaha Steaks. Fillets need a little something for more flavor, so I sautéd sliced mushrooms in butter and then made a pan sauce with red wine, a dab of Better than Boulion and a pinch of sugar. It set the steak off just right. But even better than the steak was grilled asparagus in a marvelous sauce reminiscent of a gribiche, but not a mayonnaise. It has soft boiled egg mashed using the back of a fork. The soft egg yolk makes the sauce silky and rich. The egg is blended with an emulsion of olive oil and red wine vinegar. Stir in minced shallot and diced Spanish chorizo for texture and a little zip. It is a wonderful treat of flavors and textures that makes me glad I had some left over sauce and still have some asparagus in the fridge! I did it. I bought an induction cooktop. It is the one you see on the infomercial on TV, but I mine came from the store. I didn’t get the twofers, but I’m happy with the price of my single one. It came with a ceramic lined stainless steel frypan, but no carrying case. I bought it thinking it would be a help at my cooking demos. But first, I have to experiment with it. I tested all my pots and pans with a magnet and found I do have some that are ferrous and will work on an induction cooktop. I now have an excuse to get a few more stainless steel pots and pans. I made omelets first. They turned out fine. I will have to learn to stir the egg with a heatproof non-scratch spatula, though. If you lift the pan off the burner to swirl or flip the eggs, the machine shuts off! Easy enough to punch the start button again, and it remembers the temperature setting. My second experiment was boiling water in a stainless steel pot I already. It is as fast as you’ve seen on TV! I had a two pound pork loin roast in the fridge that I needed to cook. I decided to try it on the cooktop. I seared the roast on all sides and removed it from the pan. 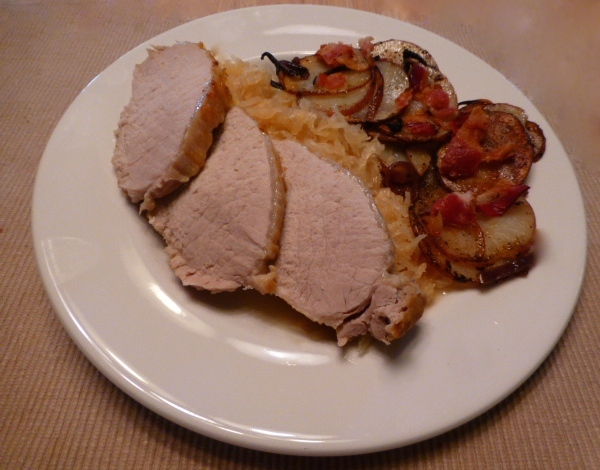 I lowered the temperature and added a can of rinsed Bavarian style sauerkraut, a peeled and diced honey crisp apple and about a half cup of apple juice and placed the roast back in the pan. I covered it and set my timer for 30 minutes. A little research said to cook pork loin roasts at 350 for 30 minutes a pound. 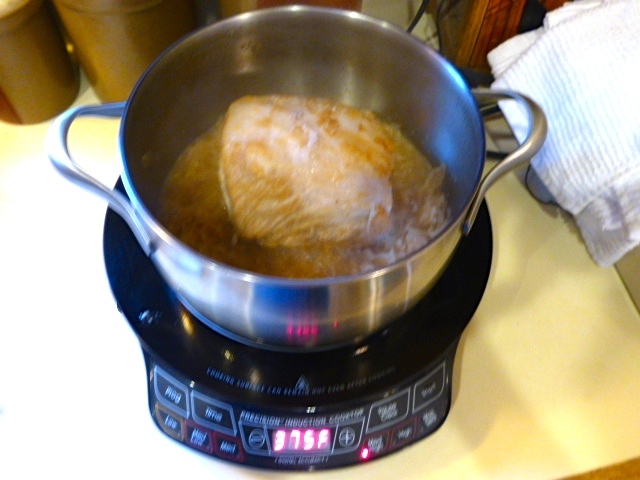 The induction cooker should cook 50 to 70 percent faster than a regular oven or burner. The picture shows a temp of 375. After putting the camera down, I figured out how to reduce the temp to 350 with the plus and minus buttons on the keypad. I checked the internal temp of the roast at 30 minutes and gave it another 5 minutes so it reached 160. I then let the roast rest for about 10 minutes. It was perfect, moist, tender and delicious with the apple kraut and potatoes with onion and bacon. Grilled salmon is a house favorite! This time, it was rubbed with Williams Sonoma Potlatch Seasoning and topped with sliced lemon on the grill. 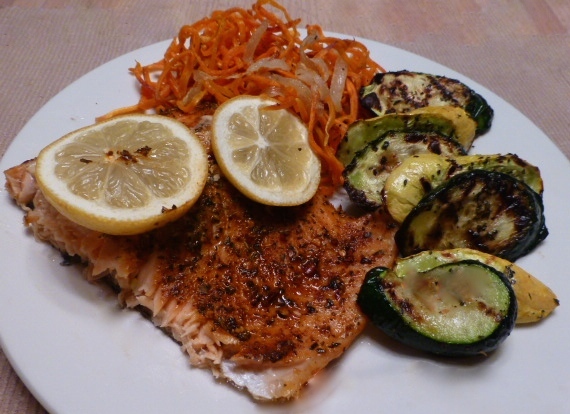 Grilled squash and lightly sautéed sweet potato and onion strings were a good complement to the salmon. One of the things I like best about El Paso is being able to grill year ’round. It’s hard to beat a rare top sirloin seasoned with just garlic powder, salt and pepper. When you take the steak off the grill and tent it with foil to rest, it releases just a little jus which is added to the dog’s kibble. She loves steak night as much as we do! This time, I carefully muscles on the grill rack. As they opened, I carefully transferred them to a shallow bowl trying very hard to not spill any of their liquor during the process. After plating the steak, muscles and grilled squash, I claimed cook’s privilege enjoyed the liquor from the holding bowl! Wonderful taste sensation! A side salad finished it all off just right. In the southwest, native peoples learned to plant the three sisters together so they could take care of each other the way good sisters do. Sister Corn grows tall and provides support for Sister Bean to grow upon. Sister Bean helps Sister Corn provide a little shade for Sister Squash, who, in turn, provides shade at the feet of all three to help conserve precious moisture in the desert climate. When the sisters met the guys from down the block, Nopalito, the prickly pear cactus, Cebolla, the onion, Ajo, the garlic, and Cilantro, the herb, they mixed it up and made a delicious side dish. They agreed next time that they would invite Chilito, a little chile, to the party to spice things up. Not to worry, Sra. 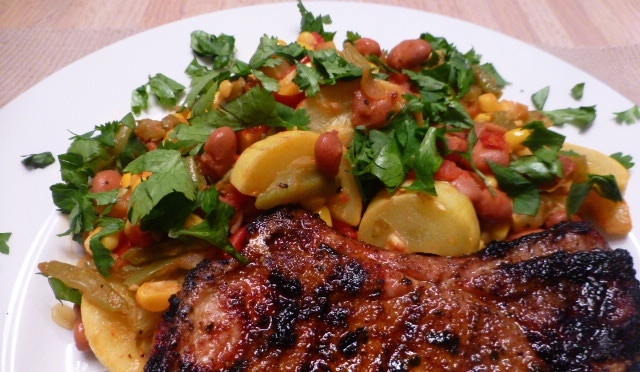 Chuleta, the grilled pork chop, chaperoned and keep things under control. My Australian friends rave about beetroot burgers. In Oz (Australia) they put sliced beets on their burgers. No green chile and cheese. I had to check this out, so Anne sent me a recipe via Dave. Ingredients are ground beef, chopped brown (yellow) onion, chopped tomatoes, egg, chopped beetroot and bread crumbs. Of course, salt and pepper to taste. Mix it all together and form into patties. Cover and chill for at least two hours. Simple enough. I reduced the recipe from 2 lbs. meat to 1/2 lb. thinking I’d get two quarter pound patties. With the added veggies, I got three good sized patties. 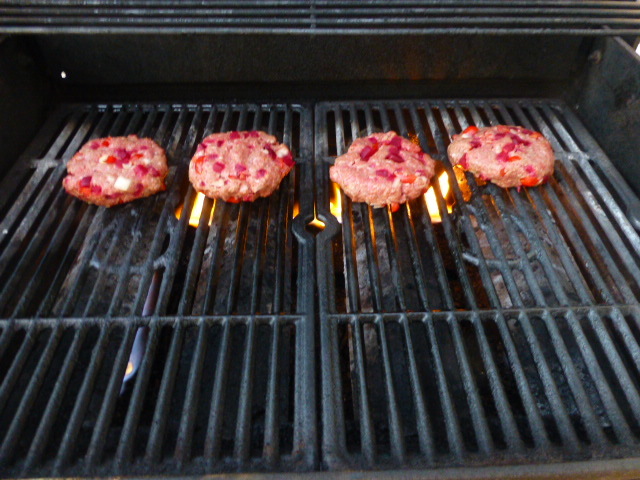 You can see the bits of onion, tomato and beets in the patties. Fire grilling for great taste. 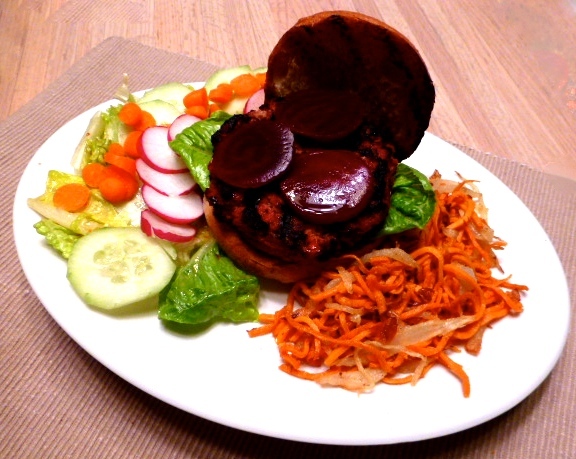 Plated beetroot burger. 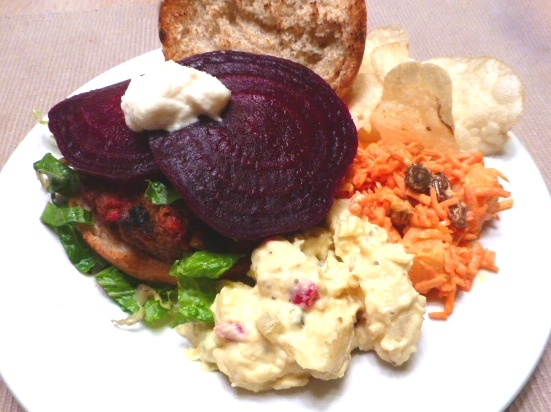 Simple salad on the side; sliced beetroot on the burger makes it authentic. The plate is finished off with fried shoestring sweet potatoes and onions, my own recipe. The verdict: Beetroot burgers are very good. We’ll be having them again, perhaps with roasted beets instead of canned. Don’t worry, Blake’s, we still love green chile cheese Lotaburgers with double chile! I love getting a bundle of asparagus that has enough enough stalks for two meals. 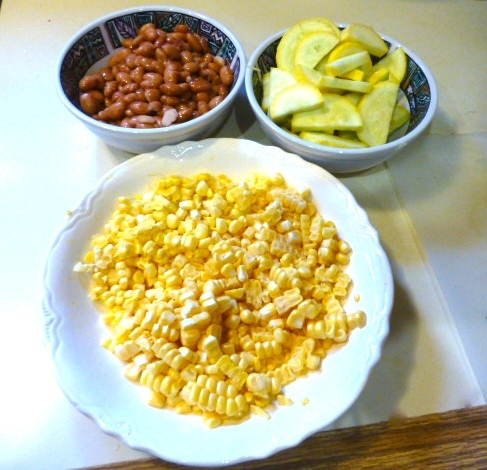 The other day, it was a side dish sprinkled with parmesan cheese. This morning, it was a key player at breakfast! 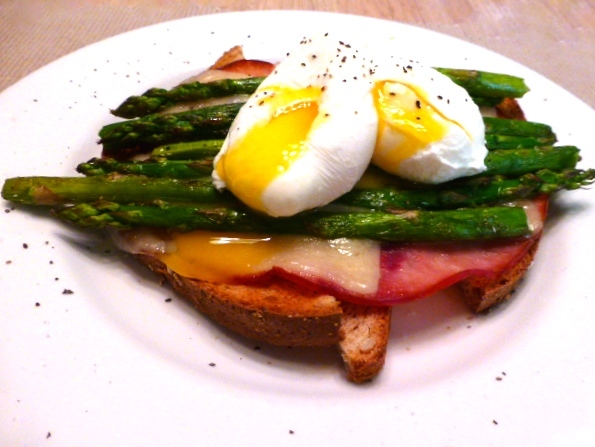 Start with a base of toasted multigrain bread, add a slice of lightly grilled ham topped with swiss cheese, the arrange pan-grilled asparagus on the cheese and pop in the warmer while you poach the eggs. One day soon, we’ll do a “how to poach an egg” page. For now, suffice it to say that when the eggs were done, the warmed plates came out of the oven and the cheese had just melted. Two poached eggs, pierced to let a little yolk spill out, a light sprinkle of salt and pepper and breakfast was terrific! A little salty, very savory and the richness of egg brought all together.